Part of what elevates installments in the horror genre from being scary to being legitimately good comes in how it reflects upon the monstrosities of humanity itself, how it makes the ugly side of people into something tangible. Unless it's a story based on real events, that sort of commentary typically gets concealed within metaphors and symbolism, creating some breathing room between the enjoyment of the horror from the real-world details of what it sets out to critique, whether it's personal ailments like psychological disorders and sexually-transmitted infections or more social concerns like racism and xenophobia. The latest installment in American Horror Story, Cult, not only doesn't try to hide the target of its condemnations, it outright names �em -- the 2016 election and the rise of Trumpism -- as the catalyst for the grim events that happen across the season. If politics isn't your thing, it'd be wise to bail on AHS: Cult; if it is, prepare for some outrageously heavy-handed theatrics and poisoning of the thematic well, which form into an off-and-on intriguing cautionary tale that's weakened by its real-world connections. The first words to come out of Cult are those of Donald Trump during the speech in which he announced his candidacy for the US presidency, funneling into a montage of some of the most critical components of his campaign and his temperament. Then, the show itself begins on "Election Night" (also the title of the first episode), depicting how the various characters absorbed the news of Trump's victory despite what was shown in that montage. Supporters of Hillary Clinton expressed their unease and fear: lesbian restaurant owners and mothers, Ally (Sarah Paulson) and Ivy (Alison Pill), look on in disbelief and await confirmation from Rachel Maddow before completely freaking out, while the college-aged Winter (Billie Lourd) laments the absence of a "trigger warning" before the Clinton loss was announced. On the other side of the coin, a twenty-something, blue-haired Trump supporter, Kai Anderson (Evan Peters) -- also Winter's brother -- loudly celebrates as he heralds the arrival of a "revolution". As Kai begins to externalize his non-politically correct attitude through fear-stoking and governmental ambition, a group of clowns starts to terrorize Ally at home and in her Michigan town. As suspicious activity crops up involving themed murders, racial profiling, and seats opening on the city council, the intentions behind Cult become quite clear: that the results of the 2016 election would result in the empowerment of unhealthy, prejudiced, violent lines of thinking. Once Kai starts to exploit the outcome to create a new political movement, actively tying his rise in influence to the victory of Trump, there's no disputing the target of Ryan Murphy and Brian Falchuk's agenda as the emboldened young man adopts certain techniques in speech delivery, persuasion, and ideology. These critiques come from a place of sincere contemplation, feelings, and concerns, but the creative forces obviously didn't want it to appear lopsided, so they also included obligatory mocking of "the other side" to seem, in some way, balanced. This doesn't work, instead weakening the character-building centered on those upset over the election's outcome. Thus, the first cluster of episodes are dreadful in the wrong ways, overzealously tackling current affairs against the backdrop of clowns perversely killing people. There's no getting away from the tones established in those first episodes, but luckily the "political movement" built by Kai eventually guides the show down its own path, moving away from being such a direct extension of "Trumpism" and into a warped extrapolation of what similar ideologies could produce. Once the following becomes a tried-and-true cult, this installment of American Horror Story nails down several episodes of interest, in which the presence of the murderous clowns -- preying on Ally's fear of �em along the way -- barrels forward on a collision course with the cult's expansion and how characters elect to join up. Certain people surrendering to Kai's techniques of persuasion make sense, soaking in the appeal of his aggressive, anarchistic cleaning of the slate; others, however, have certain sensibilities and moral barometers that make their involvement seem questionable. Perhaps that's part of what the season's about, that a manipulative leader can strike the right chords with unlikely people, but the twists resulting from those decisions are hardbound to the writing and mess with its credibility. The ability for AHS: Cult to scare those watching will largely depend on two things: exactly how terrifying they find demented clown costumes, and whether the systematic brainwashing and manipulation of a town's citizens in Trump's America disturbs them on a deeper level. Those who don't suffer from coulrophobia (fear of clowns) might struggle to embrace the horror in this season, as the jump-scares hinge more on home-invasion suspense in the vein of The Purge than exaggerated horror; there are instances of well-executed torture involving nails, hooks, and poison, as well as psychological fear involving Sarah Paulson's petrified Ally. Murphy and Falchuk want their audience to get wrapped up in the bending and breaking of minds in response to the cult, and that's the unsettling elements of the season that work, in which they introduce characters disappointed with the state of society and reveal to what lethal extremes they're willing to take it. It reaches a point where murders and authoritarian plans stack up and align in ways that can't be ignored, though, making the lack of outside intervention seem ridiculous. Even though the happenings are suspicious, Cult does finally land on a streak of effective anxiety and suspense in showcasing how the parts of the cult's machine start to fit together � that is, until the episode "Valerie Solanas Died for Your Sins: Scumbag" dismantles and reshuffles what's been established. Driven by a thoroughly unconvincing, clumsily-accented performance from Lena Dunham as Valerie Solanas, the episode transports the series back to the late-�60s to illustrate how the radical SCUM movement attempted to organize the removal of the patriarchy by outright eliminating all males from society. It's a mess of an episode that absurdly reattributes certain historical murders to Solanas' efforts, and, more importantly, it incorporates both misogyny and misandry as complications in Kai's ranks. There was something thematically compelling about how this cult's revolutionary chaos appealed to and accepted people of a broad range of stripes, something that this episode's implications confuse and tarnish in one fell swoop once they tie back into what's happening in the present era. 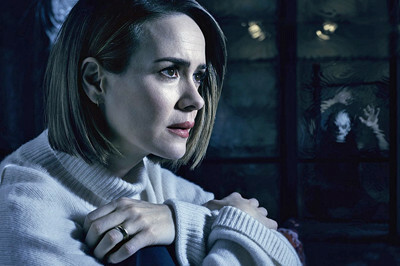 Sarah Paulson once again holds together a weaker season of American Horror Story in its follow-through, enabled by her depiction of how Ally crumbles under phobia- and anxiety-rattled psychosis and reconstructs herself in response to how she's assaulted. There's complexity to her character's fall and rise, but amid her transformation she also highlights one of the core obstacles for Cult: it's incredibly difficult to root for anybody to come out on top of this scenario, even her. Allegiances waffle and decisions are made as Kai Anderson's influence reaches its most dangerous points, and none of the often-implausible paths taken by the characters leaves them untainted at the end, a consequence of the writing attempting to paint everyone in a flawed light. 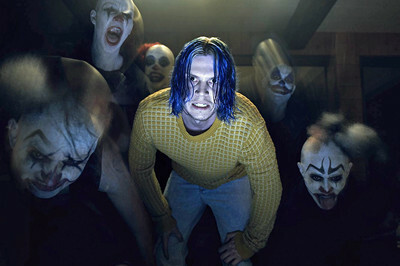 By the time Evan Peters depicts several real cult leaders through historical flashbacks as Kai tells their stories in a positive light to a legion of followers, Cult has lost the way toward being a credible horror story about the dangers of hivemind mentalities, instead reveling in the chaos, immorality, and extreme ideologies that it's created as a potential outcome of the most recent election. 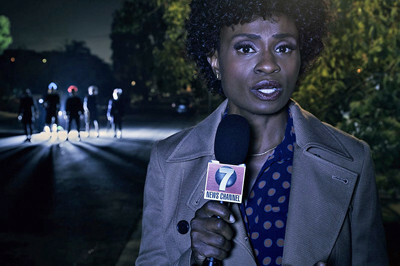 American Horror Story frequently sports some dark cinematography, yet a scenario like Cult should, in theory, yield brighter visual elements amid more everyday, frequently outdoor sequences. Oddly enough, this one feels even dimmer, where scenes in restaurants, basements, even homes are shrouded in gloomy shadows and haze. The most intriguing visual aspects of the seasons can be found in the production design involved with the more gruesome, straight-up horror facets, such as the clown costumes and the usage of nails and hooks for torture devices, and the textural details found within those are moderately impressive through this slate of eleven 1.78:1-framed, 16x9 enhanced transfers. The bright red of "Make America Great Again" hats offer some of the boldest colors throughout the season, while the crimson shades of blood upon walls and the deep blue color of Kai's dyed hair provide more nuanced, deeper saturation facets. There's some flatness here and there, but the contemporary depth and crispness of the photography have a strong turnout in this standard definition presentation. In just about every episode of AHS: Cult, there's something loud that goes on -- whether it's a murder sequence or home-invasion peril -- to which the 5.1 Dolby Digital tracks across all episodes handle the potency with enough care to be satisfying. The sounds of a nailgun have a skin-crawling potency to their clarity and midrange bass responsiveness, as do a few stab wounds and quite a number of gunshots. The chants of crowds and cults alike engage a moderate amount of surround activity, mostly lingering in the front and trailing to the rears for less-than-enthusiastic immersion. Dialogue is respectably natural and clear, with fine upper-end clarity and moderately satisfying heft. The music overpowers scenes, but in all the right ways and doesn't entirely swallow up minor details within, and helps to amplify the few jump-scared contained within. Only a few FX Promo Spots (1:44, 16x9) occupy the extras wing on the last disc. Perhaps I should get this out of the way first in my conclusion: out of the many options out there for seasonal Halloween viewing, American Horror Story: Cult wouldn't be among the best choices if one hopes to get wrapped up in a spooky mood. Aside from the creepiness of the clown masks, the horror involved here centers less on traditional jump-scare or atmospheric tactics and more on the ugly, violent facets of the human condition, notably the sorts of people who are heavily influenced by politics and persuaded by leaders to do outlandish things. Moreover, the heavy-handed politics that frontload this installment in AHS make it difficult to move beyond the first couple of episodes, regardless of one's leanings. Despite a scattering of raw, forceful performances -- Evan Peters is unsettling as cult-leader/politician Kai Anderson; Sarah Paulson digs deep into psychological torment as restaurateur Ally -- Cult struggles with a credible flow of events and evolution of characters, and that's even more pertinent this time around with the real-world elements that flow throughout the season. The DVD looks and sounds fine, but one serving should be enough for just about anyone to drink down. Rent It.